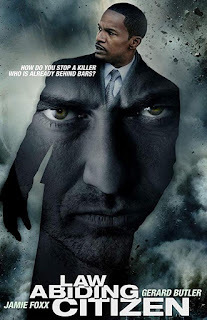 Law Abiding Citizen, It's directed by F. Gary Gray (Set It Off, The Italian Job, The Negotiator), starts fast, before we even get a feel for the family dynamics, Clyde Shelton (Gerard Butler) experiences a home invasion that ends up getting his family killed. But the story is not about the the actual invasion as it is about getting revenge or justice served for deeds done. It's about one person's skewed perspective on what they perceive to be a corrupt legal system. Or, a confusing story of how justice should be served. This does not sit well with Shelton. Ten years pass and the convicted killer is put to death by the legal system but things go horribly wrong with the injections and the man suffers a horrible passing. Not long after, Shelton captures the other criminal and tortures him to death. And then he turns his attention to the legal system that allowed this to happen, by, off all things, letting himself be captured for his torture and murder of one of the men who killed his family. But while he's in prison, events start to unfold that exacts revenge on the legal system that failed him, but who would be attacking the legal system and it's flaws if it's not Shelton? All will come together as the story evolves, and it's a set of fascinating developments that brings us into the third act of the film. For me the story went from interesting to curiously captivating, right up until when the details start to unfold for the climax in a tale of how society is not always happy with how the civil system works for or against them.